There are three main types of cucumbers and they include the slicing, pickling, and burpless variety. The cucumber is a widely cultivated plant in the gourd family known as Cucurbitaceae. 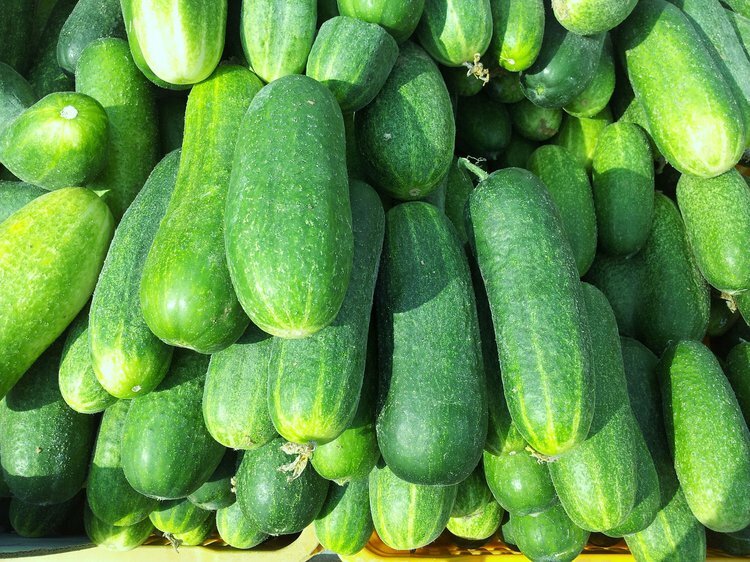 According to the UN Food and Agriculture Organization, China produced at least 60% of the global output of cucumbers in 2005, followed by Turkey, Russia, Iran, and the United States. There are three main types of cucumbers and they include the slicing, pickling, and burpless variety. Generally, freshly eaten cucumbers are called cucumbers. Cucumbers that are pickled are pickled cucumbers, where they are put in salted brine for an extended time period. Burpless cucumbers have a sweeter taste and a thinner skin than other varieties of cucumbers. In terms of the nutritional value of cucumbers, they are low in calories, making it a great snack to munch on. Cucumbers are very filling and satisfy hunger without increasing the calorie count. One cup of cucumbers contains only 16 calories. This low-calorie but nutritionally dense food is a perfect choice for weight loss. But one may wonder, with such few calories, are cucumbers good for you? Cucumbers have a low glycemic index rating because of its low calorie and sugar content. The glycemic index (GI) ranks food and drinks based on their potential to increase blood sugar. Foods high on the glycemic index, such as white rice and white bread, will break down easily and cause blood sugar and insulin level spikes after meals, which is followed by rapidly dropping blood sugar levels. The sugar from cucumbers is slowly absorbed into the bloodstream. This can help prevent sudden a drop in sugar levels, sugar cravings, and mood swings. Another health benefit of cucumbers is that they can help improve bone health. Vitamin K may play a role in promoting bone growth. Many people know that calcium is essential for improved bone health, but vitamin K is one of the compounds that helps the body absorb calcium. Therefore, sufficient consumption of vitamin K helps promote stronger bones and may delay osteoporosis. Cucumbers can also help individuals with a B-vitamin complex deficiency. Cucumbers contain B-vitamin components, particularly thiamin (B1) and niacin (B3). Thiamin is essential for maintaining proper nerve health and cognitive function. Niacin has been known to increase an individual’s “good” cholesterol and reduce cardiovascular risks. A deficiency of niacin leads to Pellagra, a disease that is caused by niacin deficiency with symptoms of diarrhea, dementia, dermatitis, and insomnia. The cucumber is also a good source of pantothenic acid (vitamin B5), which is an essential vitamin for carbohydrate, protein, and lipid metabolism in the body. Folic acid (vitamin B9) helps the body produce healthy red blood cells and prevents anemia. It is also necessary for assisting in ‘quick’ cell divisions and growth such as during infancy and pregnancy. A deficiency of folic acid in pregnant women can lead to birth defects such as neural tube defects and low birth weight. Another benefit of cucumbers is that they are loaded with minerals that have many positive effects. They also have a significantly high potassium to sodium ratio. This helps the blood vessels relax and maintain a healthy blood pressure. Also, a high potassium diet reduces strain on the heart and increases overall cardiovascular health. Relaxed blood vessels can help individuals sleep, which is why cucumbers can help promote a better sleep. Potassium is not the only one contributing to relaxed blood vessels; magnesium is a mineral that is directly linked to improving the quality of sleep, affecting sleep duration and its restfulness. Cucumbers also help regulate body metabolism in order to help reduce sleep disorders and the occurrence of insomnia. Cucumbers can assist in energy production and antioxidant defense. It has the mineral manganese, which supports a number of enzymes in energy production and antioxidant defenses. Cucumbers are full of water and can rehydrate, as well as provide valuable nutrients. It can cause the blood vessels to relax and help improve blood pressure. Moreover, cucumbers are beneficial in fighting diseases and infections with its antioxidants and effectiveness in inducing sleep. Cappuccio, F. P., & MacGregor, G. A. (1991). Does potassium supplementation lower blood pressure? A meta-analysis of published trials.Journal of hypertension, 9(5), 465-473. Zwingmann, C., Leibfritz, D., & Hazell, A. S. (2003). Energy Metabolism in Astrocytes and Neurons Treated With Manganese&colon; Relation Among Cell-Specific Energy Failure, Glucose Metabolism, and Intercellular Trafficking Using Multinuclear NMR-Spectroscopic Analysis. Journal of Cerebral Blood Flow & Metabolism, 23(6), 756-771. Rahman, A. H. (2003). Bottle Gourd (Lagenaria siceraria)-a vegetable for good health. Natural product radiance, 2(5), 249-250. Mongkolsilp, S., Pongbupakit, I., Sae-Lee, N., & Sitthithaworn, W. (2004). Radical scavenging activity and total phenolic content of medicinal plants used in primary health care. SWU J Pharm Sci, 9(1), 32-35. Singh, A., Sharma, R. K., Agrawal, M., & Marshall, F. M. (2010). Health risk assessment of heavy metals via dietary intake of foodstuffs from the wastewater irrigated site of a dry tropical area of India. Food and Chemical Toxicology, 48(2), 611-619. Patel, E., & Krishnamurthy, R. A. (2013). Review on the potency of some Cucurbitaceae plants against hepatitis and antimicrobial activities. Indian J Fundamental Appl Life Sci, 3, 13-8. Shrivastava, A., & Roy, S. (2013). Cucurbitaceae: A ethnomedicinally important vegetable family. Journal of Medicinal Plants, 1(4). Ojewole, J. A., Adewole, S. O., & Olayiwola, G. (2005). Hypoglycaemic and hypotensive effects of Momordica charantia Linn (Cucurbitaceae) whole-plant aqueous extract in rats. Cardiovascular journal of South Africa: official journal for Southern Africa Cardiac Society [and] South African Society of Cardiac Practitioners, 17(5), 227-232.